Asset allocation has a larger impact on overall results than specific security selection. Researchers argue about the degree of impact, but all agree the impact is major. Asset allocation comes first, and then security selection within asset categories. Apart from cash reserves for expected withdrawals, or as dry powder for tactical purchases, the primary assets in allocation are stocks and bonds. 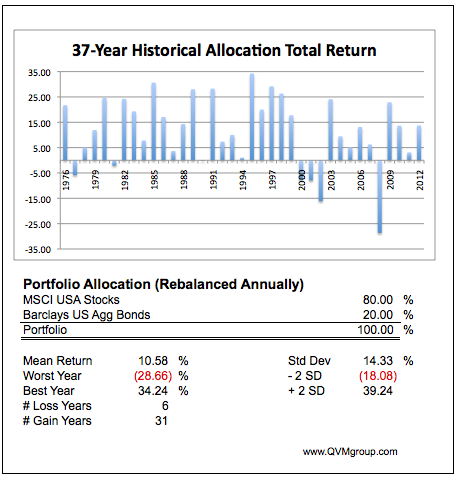 Let’s look at the 37-year history from 1976-2012 for various allocation levels between US bonds and US stocks. First let’s look at a summary for each of three allocation risk levels: 60/40 stock/bonds, 80/20 and 20/80. You will notice in Figures 1-3 that higher stock allocations produced higher mean returns, but also higher volatility, more loss years, and more severe worst years, as well as higher best years. On the other end of the scale, higher bond allocations produced lower mean returns, but also lower volatility, fewer loss years, and less severe worst years and more modest best years. The venerable 60/40 allocation has an in-between set of attributes. Note: The “-2 SD” and “+2 SD” show the return levels that are two standard deviations on either side of the 37-year mean return. In theory, two standard deviations encompasses almost 98% of probable prices, with only slightly more than a 1% probability of prices outside of either side of that range. Infrequently prices move outside the 2 standard deviation range, as they did in the 2008 crash, which was out several standard deviations (a “black swan”). The 60/40 allocation has a +/- 2 Std Dev return range of negative 12% to positive 32%, versus the 80/20 with a negative 18% to positive 39%, versus the 20/80 with a negative 4% to positive 22%. The 60/40 had 5 loss years out of 37. The 80/20 had 6 loss years out of 37, but the 20/80 had only 2 loss years. The actual worst year experiences of the 60/40 and 20/80 were within their probable price ranges, but the 80/20 stock/bond mix went in to Black Swan territory by going well beyond negative 2 standard deviations in the 2008-2009 crash. Caution: Interest rates have declined for over 30 years, from a peak in 1981 to historical lows in 2013, resulting in both interest return and capital gain return for bonds. For the next several years interest rates are likely to rise, resulting in negative capital gains. Therefore, the historical data is probably overstating the potential for allocations involving bonds until rates normalize (perhaps at 10-year Treasuries yielding 4% to 5%). We present data here for 11 levels of risk from Fully Aggressive (100% stocks) to Fully Conservative (100% bonds) and 9 mix levels between. We call the range from 60/40 stocks/bonds to 40/60, Balanced-Aggressive to Balanced-Conservative. Outside of those ranges, we call the allocation either Conservative to some degree or Aggressive to some degree. The tables assume annual rebalancing at year-end, with no tax or transaction cost impact (most like rebalancing in a tax deferred or tax exempt account). Figure 4 shows the nominal geometric mean return for the 11 risk levels over 37 years through 2012 ranged from 8.18% to 10.89%, with worst years from negative 2.92% to negative 37.14%. The volatility (standard deviation) for bonds is less than the mean return, but for stocks is significantly greater than the mean return. Figure 5 shows the geometric mean return for periods of various length leading up to Dec 31, 2012. The data show bond returns generally declining as periods grow shorter; and stock returns for 3 years about the same as for 37 years, with returns for 5 through 25 years lower (5 years being only 1.79%). Figure 6 shows the return for the various allocations on a calendar year basis from 2006 – 2012. All are positive except for 2008, with only 100% and 90% bonds being positive that year. Figure 7 shows the number of years out of 37 that returned at least x% (from 3% to 10%) by allocation mix. This is particularly interesting for personal planning, if you are in or near the distribution stage of portfolio life. For individuals thinking of their retirement draw rate in the 3% to 4% range, no allocation achieved that level of return in all years. Note: these data do not show the impact of structuring a portfolio with dividend growth stocks that history shows outperform stocks overall, and that may be necessary to deal with future inflation; nor do they show the probable under-performance of bonds for the next few years as rate rise. Fund organizations try to solve the allocation choice with target date funds, which are based on the year in which the portfolio goes from being one of accumulation to one of distribution — going from more aggressive in early accumulation years to progressively more conservative as the distribution phase is near or present. 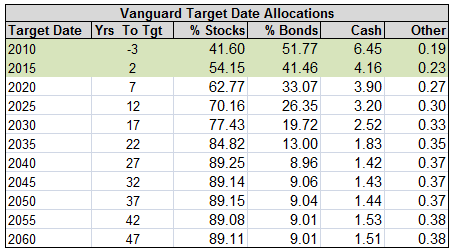 Review of the few dozen organizations that offer target date funds show wide variation in what each believes to be appropriate for each portfolio life stage. Such funds have as a weakness that they assume some standardized, universal investor who may not be the same as you – with different levels of accumulation, different needed/desired standard of living in retirement, different levels of wages or entrepreneurial income at the same time portfolio withdrawals are being made, different emotional limits on how much volatility can be tolerated, how much you want to focus on preservation versus growth, whether you wish to leave an estate or consume all portfolio assets during your lifetime, and other factors. While too generic, these funds do provide some third party perspective that can sometimes serve as a reality check –something from which to deviate with purpose and conviction to customize an allocation to your specific circumstances..
Vanguard is one of the target date fund providers. 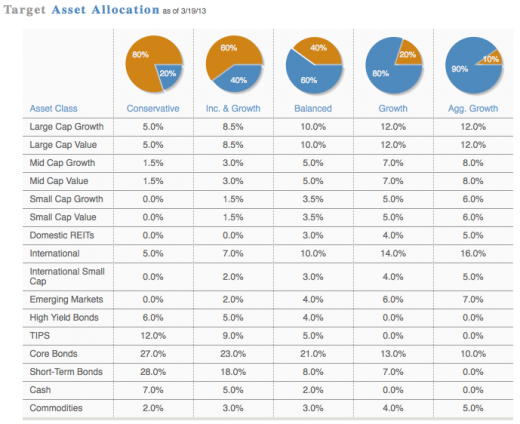 Here is how they allocate between the three primary asset categories (Equities, Debt, and Cash). You can see the progressive move toward bonds and reduction in stocks as the withdrawal stage approaches, with high stocks and low bonds when the withdrawal stage is distant; as well as minimal cash liquidity in early years, and larger cash liquidity in later years. During the distribution stage, it can be helpful to have enough cash to fund the difference (if any) between expected annual withdrawals and expected annual dividend and interest income. 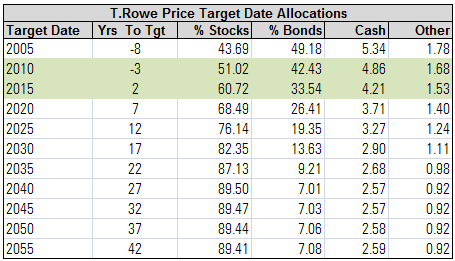 T.Rowe Price takes a more aggressive approach to target date investing for those near or recently in the withdrawal stage, as you can see in Figure 9 in the green shaded rows for target dates 2010 and 2015 compared to the green shaded rows on Figure 8 for the Vanguard funds. Other fund sponsors have yet different allocations for the same target dates. There is no agreed appropriate allocation, and perhaps the design teams have different profiles of the investors they are serving at each target date. These funds and other allocation models are primarily useful as thought provokers and as a reality check, but not necessarily as automatic investment options. Customization to your particular circumstances is appropriate. Returns vary based on the use or non-use of rebalancing and the frequency and/or triggers for rebalancing. There are debates about the return value of rebalancing, but the more certain utility of rebalancing is maintaining a volatility (risk) level for the portfolio. The data that we provide above assumes annual rebalancing and no tax or trading costs impact . The rebalancing approach is more correct for IRA. 401-k, 403-b, foundation, pension plans and similar accounts, but is generally illustrative for all accounts (with acknowledgement that current taxation eats into capital somewhat in regular accounts). The theory of rebalancing is that you sell-down winners that have exceeded their allocation target, and buy-up assets that are below their target level. Ideally, all assets do well, but one does better than the other. Sometimes, though, one asset does badly, and instead of having faith in the long-term, our fears take over and we fail to rebalance, thus not achieving the theoretical results that rebalancing history suggests. Example: When the stock market crashed in 2008-2009, a dutiful rebalancer would have reduced bond holdings and increased stock holdings to maintain allocation policy levels. However, at that time the world seemed like it was going down the drain, and many (perhaps most) “practitioners” of rebalancing went to cash or bought more bonds. They did not achieve the same result as historic rebalancing data shows. The comparative benefit of stocks and bonds may be dependent on ever changing tax regimes, and on the type of account (taxable, tax deferred or tax exempt) in which the assets are held. The efficiency of rebalancing is also impacted by the tax status of the portfolio account. Bottom line — allocation models are just, models. Investors should be aware of the models and their implications, and then devise what fits their circumstances best. The actuarial consulting firm Callan produced some interesting long-term return charts for stocks and bonds for NASRA (National Association of State Retirement Administrators). The full report is available at this link. The first Callan chart in Figure 10 shows the real (excess of inflation) return of US stocks and US bonds for 10-year rolling periods and 30-year rolling periods from 1936 through 2009. The data for the last 35 years is for the Russell 3000 stocks (proxy: IWV) and the Barclays Aggregate Bond index (proxy: BND) [prior periods are backfilled with Ibbotson data]. Bonds – Over 10-year rolling periods bonds ranged from roughly negative 5% to positive 10% real return, with a 73-year average of positive 2%. Over 30-year rolling periods, bonds averaged a 1.4% real yield, with what looks like a low of less than negative 2% and a high of about 5%. 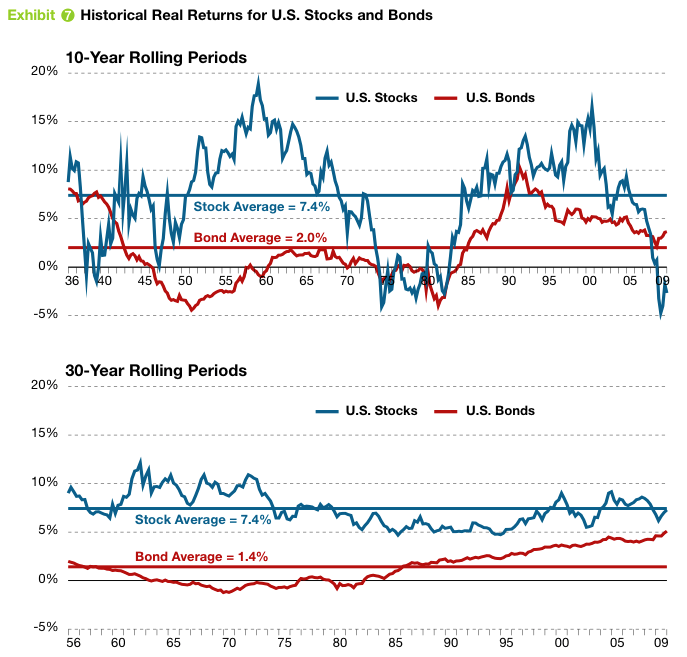 Stocks – Over 10-year rolling periods, stocks averaged 7.4% real returns, with a range of about negative 5% to positive 20%. Over 30-year rolling periods, stocks also averaged 7.4% real returns, with a range of about negative 5% to positive 12%. 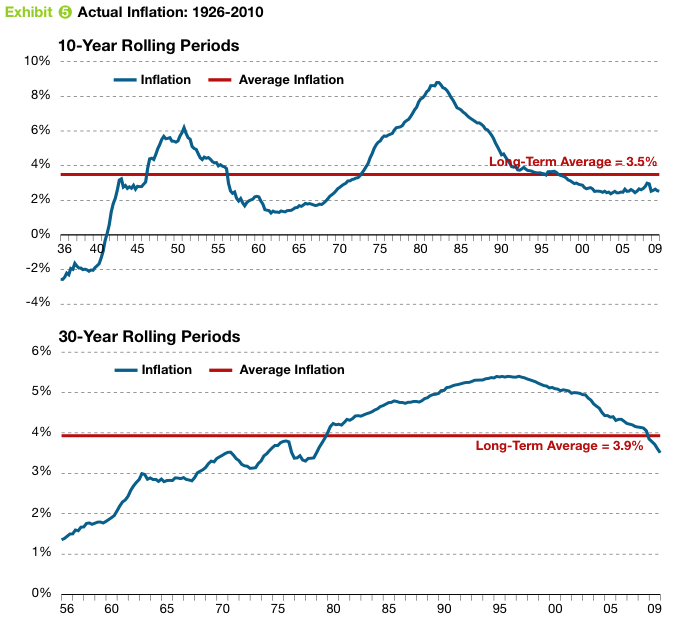 Inflation or deflation has been all over the lot, but has a 3.5% to 3.9% long-term average. 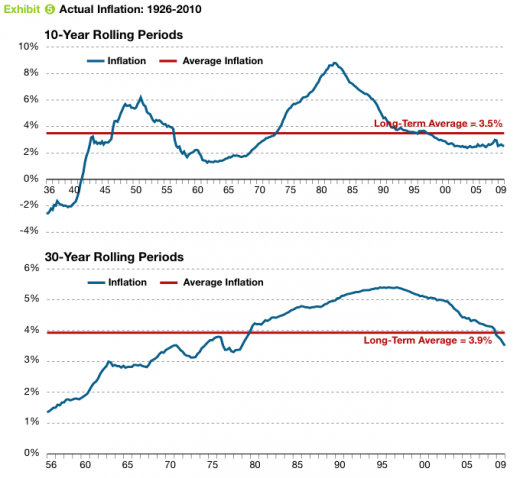 Add the inflation rate to the real return of stocks and bonds to compute the long-term average nominal returns. 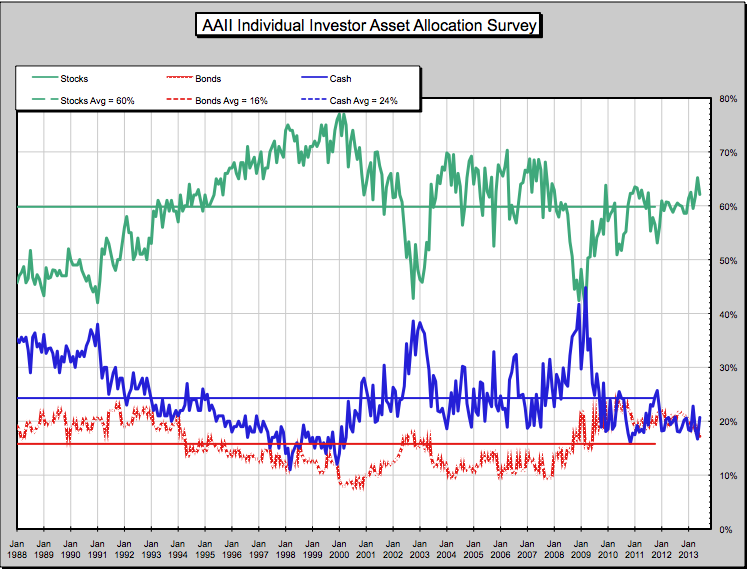 What Is The Overall Allocation By Retail Investors? Mutual fund holdings give one view on individual holdings. 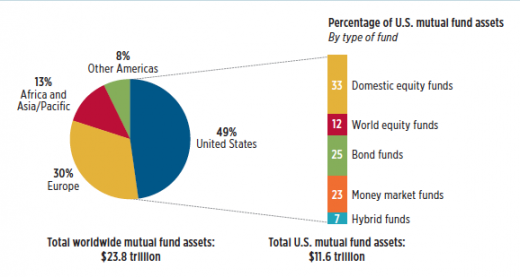 As of 2012, the Investment Company Institute reports US mutual fund assets consisted of 45% stock funds, 25% bond funds, 23% money market funds, and 7% hybrid funds. US assets were 49% of holdings, with Europe representing 30% and the balance in the rest of the world. That is pretty much the Balanced-Moderate risk level in our eleven level scale. 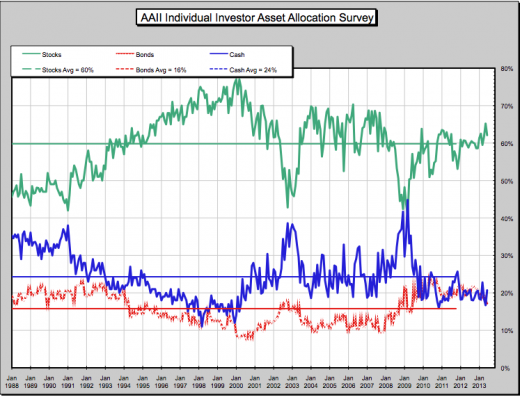 The American Association of Individual Investors surveys regularly, and focuses on all security types. 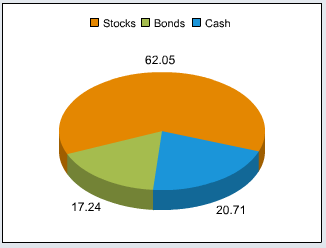 Currently they report 62.05% stocks (30.67% funds and 31.38% individual stocks), 17.24% bonds (13.50% funds and 3.74% individual bonds) and 20.71% cash. They also provide the long-term history of their survey as shown in Figure 14 for data since 1987. Stocks are slightly above the long-term average, bonds are materially below, and cash is high. These three ETFs from iShares are based on the S&P Target Risk models. They invest in a collection of other iShares ETFs to achieve these allocations with diversification among sub-classes. Figure 16 shows how they choose to populate each risk level with types of ETFs. As a matter of curiosity you might want to know how the total outstanding market-cap of investable stocks and bonds looks at this time. That is what everybody in the work owns as one giant asset allocation. Vanguard put out a nice pie chart for that to accompany their corresponding ETFs. 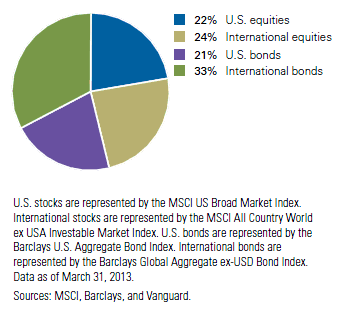 The world allocation is 46% stocks and 54% bonds, as shown in figure 17. For accounts were we are one of several managers, our allocation is 90% to 100% stocks, due to the mandate. As of this writing, for accounts we manage as the only manager, they are predominantly for high net worth investors in the later stages of asset accumulation or in the withdrawal stage. In those cases, our current allocation for bonds and cash range from 25% to 33% (with cash between 5% and 10%), and for equities from 67% to 75% — moderately aggressive. Super Classes tend to be in the 30/70 to 70/30 range for Owning (mostly stocks) and for Loaning (mostly bonds) depending on account/Client specifics. Reserving (mostly money market funds) tends to be from 0% to 10% depending on account/Client specifics. 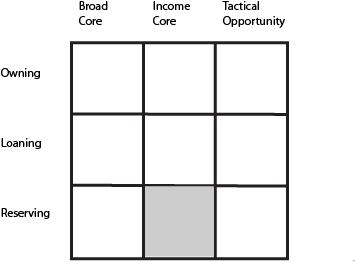 Portfolio Roles tend to have minimum and maximum allocations of from 30% to 70% for Broad Core; 30% to 50% for Income Core, and 0% to 20% for Tactical opportunity. The minimum and maximums and target levels are determined by account specifics and are codified in the Investment Policy along with the SuperClass allocations. Our security selection approach at this time for bonds is to bias toward shorter duration, variable rates, more credit risk than interest rate risk, and reduced bond allocation in favor of a combination of tactical cash and high quality dividend growth stocks. For stocks, we favor US over international stocks, and European over other international stocks. We emphasize high quality, dividend growth stocks. This entry was posted on Tuesday, July 30th, 2013 at 7:48 PM and is filed under Data. You can follow any responses to this entry through the RSS 2.0 feed. Both comments and pings are currently closed.